Ok, that last part didn’t really go that way, but you get the picture! That was my wish and my goal for Mother’s Day… but more on that later. Now that our first official event is complete, it’s on to the next big adventure! 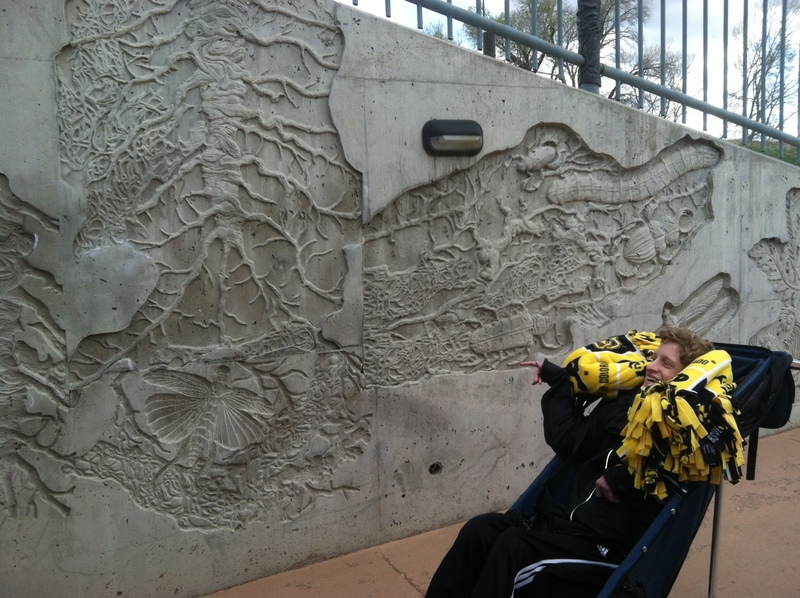 We are training for the Pelican Fest Triathlon, May 26 in Windsor, CO! Several people have asked me, “So, exactly how do you do a triathlon with Athletes in Tandem?” Well, I know how it’s done… in theory. I mean, I’ve seen the pictures, which is almost the same as doing it, right? Riiiiight! OK, seriously, a triathlon is a multi-sport event in which you swim then bike then run. Whew. 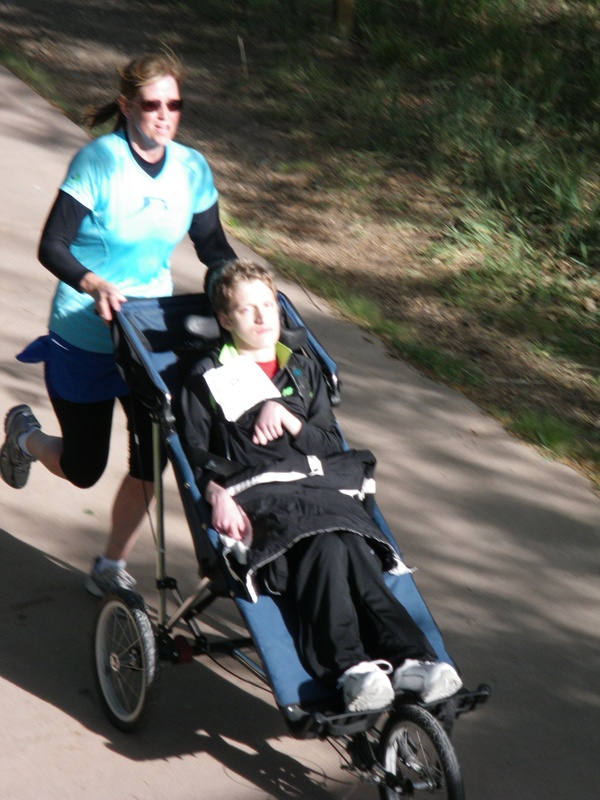 With Athletes in Tandem, special adaptive equipment must be used in order to facilitate the “tandem” part. DOUBLE Whew! There is a lot more than physical training that needs to be done in order to prepare for this tri. I’ve familiarized myself with the equipment, practiced with it, and understand what happens during “transition” where you move from one sport to the next. When we start, the raft will be ready to go… 800 meters! When I’m finished swimming, someone will need to get Zachary into his stroller and wheel him to the bike area while I try to peel off the wetsuit I’ve squeezed myself into! Then I’ll go to the bike area, put on my bike shoes, helmet, hook up the bike trailer (if it’s not already hooked up) and GO! Ten miles! 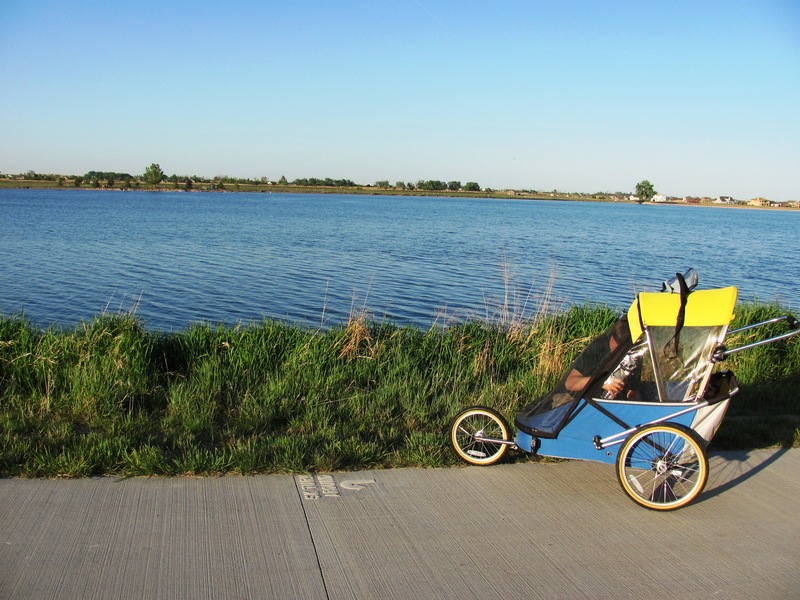 Finally, when I’m finished with the bike, someone will hold Zachary while I convert the bike stroller to a jogger. Then I switch to my running shoes, ditch my bike helmet and we’re off for a 5K! Something like that – I still need to confirm these details with my helpers! Well, my Mother’s Day plans were foiled by a flat stroller tire. Yeah, after I had waited until late afternoon, loaded everything up and drove to Windsor Lake. I was completely unprepared! I had no patch kit, no spare tube (not that I’ve ever patched or replaced a bike tube)! What was I thinking? “Grrr!” Michael made some reference to a famous comic book character that turns green when he’s angry: “Mommy SMASH!” At least he made me laugh – love that kiddo! Sort of ironic, but I didn’t really think about a plan B until I was talking to Sandy and Mike about things that could happen at the event. First of all, it could be too cold, rainy, or windy for Zachary to participate. Participation should be a pleasurable experience and we would hate for him be cold, wet and miserable for whatever length of time it will take me to complete the tri! Well, some things I can’t control, like the weather. In the event that Zachary is unable to join me, of course I’ll be sad but I’ll be thinking about him and doing my best for my partner! Things like flat tires I can prepare for. After my Mother’s Day mishap I bought a patch kit, tubes, Slime, thorn-resistant liners to go in the tires, AND attended Andrew’s flat repair and tube-changing clinic. The next day, with new tubes, Slime and whatnot I convinced Michael to give it another try! 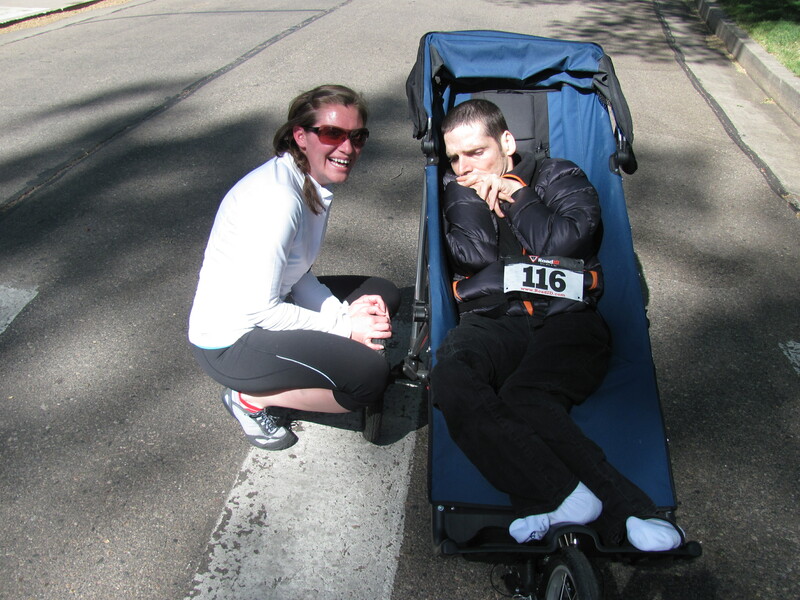 We did the 10 mile bike ride, transition including converting the bike stroller to a jogger and the 5K run! All with times that I will be proud of for my first triathlon! 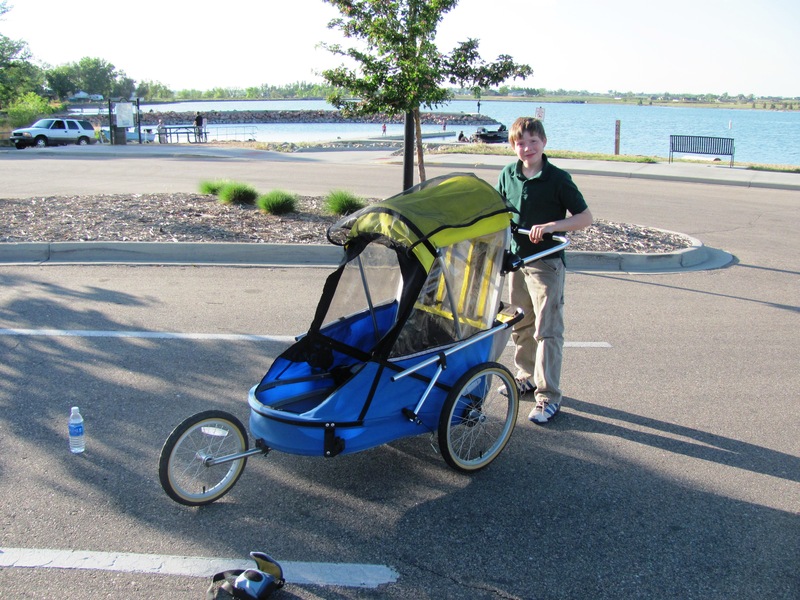 Ride 10 miles with Zachary in the Community Classics Bike Tour in Loveland this Sunday! Attend Wendy’s open water swim clinic at Windsor Lake after Sunday’s ride! Just a few things! I’m counting down the days and feeling like I’m scrambling to get things done, but I think we can do it! In fact, I KNOW we can! Come out and cheer us on! Zachary will love it! We both will! And send all your love, prayers, wishes, and good vibes for great weather and no need for that Plan B! Oh my! What a day! I don’t even know where to start, except to say, “We did it!” Zachary and I finished the 10K in 1:17! Even though Zachary has participated in many races, this was my first official 10K! So many things went great yesterday. 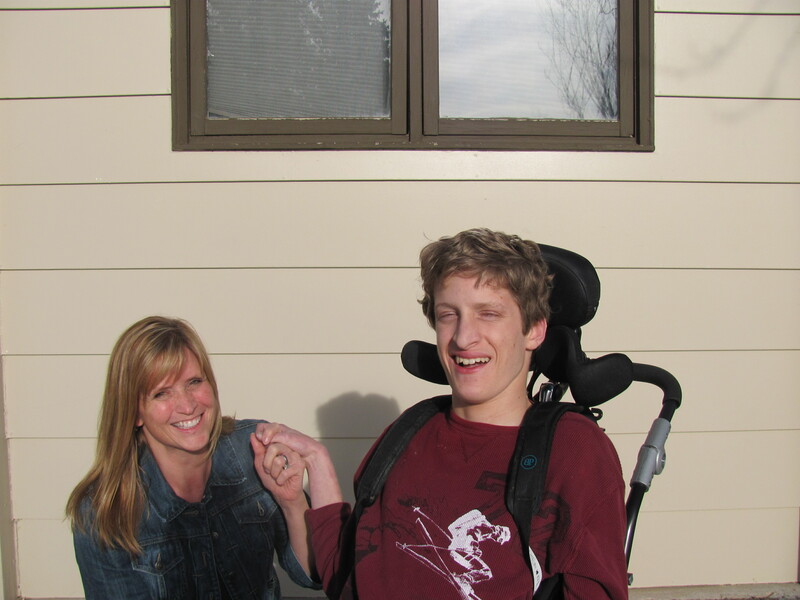 When Zachary showed up, he was ready to go and clearly excited – and so was I! I even had trouble sleeping the night before. I woke up at 1:30 and thought it was time to get up and get ready! My legs were achy and wanted to MOVE! Then I woke up again at 4:58, just before my alarm. It sort of made me feel like a kiddo again… anticipation before a big track meet (discus thrower, not runner) or the night before skiing! I always had trouble sleeping the night before skiing! I dropped my friend Jen off at the half marathon bus at 5:30(ish) and then killed some time before the 10K. Jen did a great job, by the way! Improved her PR in the half by about 30 minutes! Round of applause! Friends and family were there to support us, just adding to my excitement! Zachary’s mom Sandy was there, several of my friends were running, and two even offered to give up their bibs when I was worried we might not have one… they knew how much this meant to us! I love my people! Hubby Andrew was there to take pictures, not just at the end, but at FOUR locations! He’s lucky we weren’t going faster or he might have missed us! When the race started, I was walking, but then I said to myself, “What am I doing? 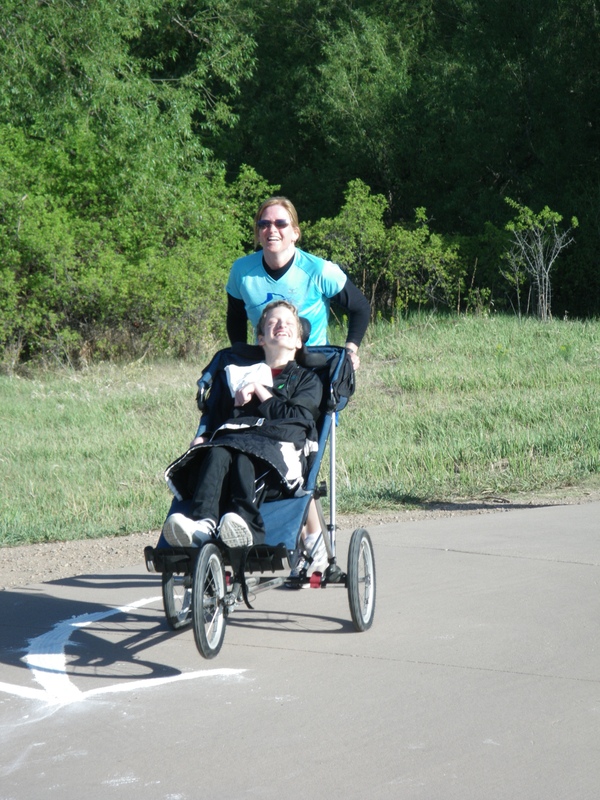 We are going to run if we’re able!” We were able to – Tandem-style! I hate to admit it, but my trusty Garmin failed me. Operator error? Perhaps. Regardless, when I realized it wasn’t working and my battery was low, I nearly panicked! What’s our pace? Do we need to go faster? Ahhh! Help! Luckily, we ended up keeping pace with a great guy (we’ll call him the Human Garmin, or “HG” for short) who was kind enough to give me updates on our pace and distance! HG told me that he had been training for the marathon when he hurt his back. His doc had just given him a release to run again. He said, “This is an incredible thing you’re doing.” But you know, it works both ways; I’m getting something out of this, too! I told HG that – I hope he was listening! That just goes to show, when the timer starts each of us runs our own race! One of my greatest realizations the past couple of years is that people of all ages and shapes and abilities compete in races, marathons, triathlons. It’s amazing! So why not me with my uncooperative hips or creaky-knee-du-jour? I can train within reason. I don’t have to be an elite athlete to challenge myself and share my love of fitness and being outside with Zachary and others. Oh, the freedom that came with that realization! Why not US? Sharing the things that Zachary was checking out during the race was awesome – the yellow caution tape along the road, which he tried to touch the entire time we ran by, the beautiful Poudre River (I like to think of it as MY river), the water station folks who cheered for him and knew his name (he’s famous, by the way) and the runners who were running along with us, cheering him on. That was inspiring, too! In fact, the entire last mile of the Poudre Trail, I heard nothing but happy sounds from my friend. Zachary and I were so noisy; we even caused a few runners to turn around to see what was going on as we came up behind them! Then we passed them! Are you getting the picture? If not, here’s one smiley photo taken by Hubby. OK, maybe I look like I was crying, but I really wasn’t! I promise! Also notice Zachary holding our race bib! He grabbed onto it right after I pinned it on his shirt and held it most of the way. With about 200 yards to go, I was pooped, but HG was there to encourage us and lead us to the finish line! I wish I would have gotten his name because I wanted to thank him in my blog. I wanted to tell him more about Athletes in Tandem! I want to tell everyone about AiT! I looked for HG after the race, but to no avail. Maybe, by some small chance he will read this – Thanks, HG! Keep up the great work and I hope your back is all better soon! 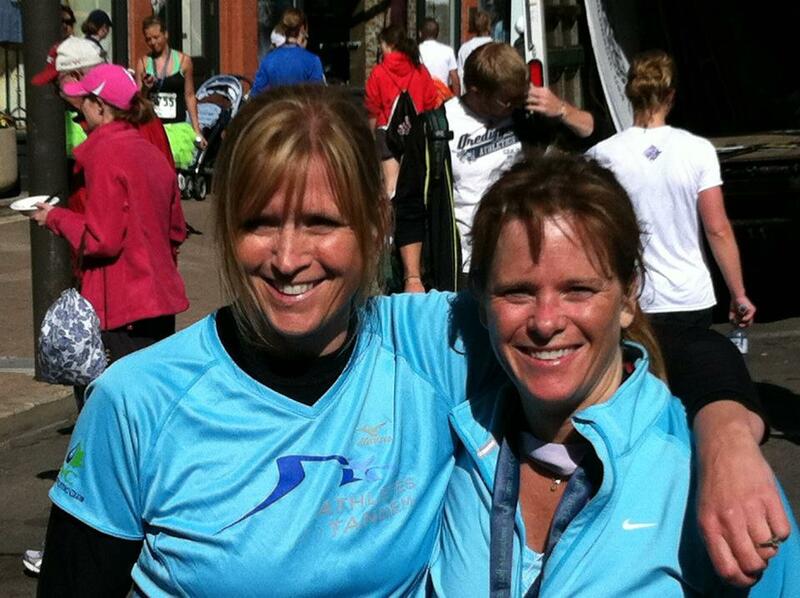 Maybe we will see you at the Horsetooth Half or the CO Marathon next year! I may have been pushing Zachary, but the truth of the matter is that HE pushes ME! I like to think it is a mutually rewarding partnership! 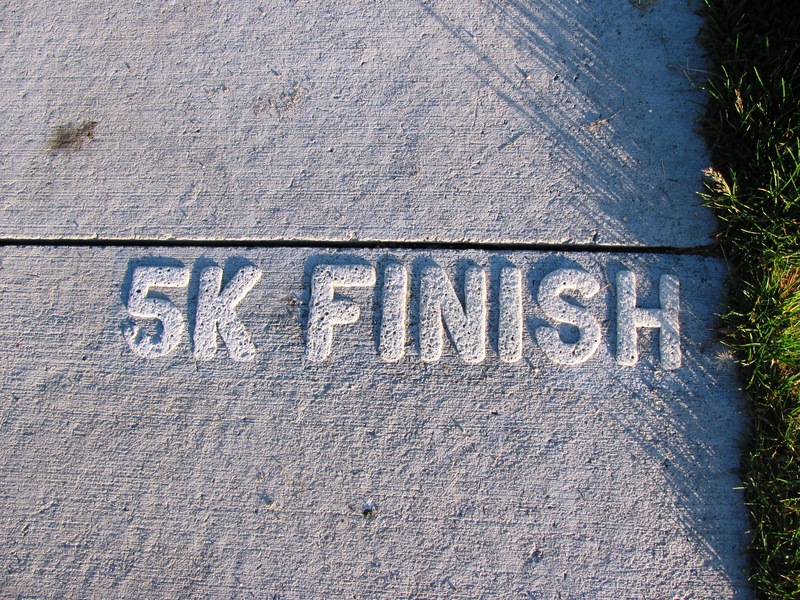 OK, last week I reblogged a post called Automattic’s Worldwide WP 5K. In case you didn’t read it, the challenge was to get folks all over the world to participate in a 5K in any way that suits them and to just get moving! I promised I would join in the fun and asked my Facebook friends to send me info about how they got moving, too! 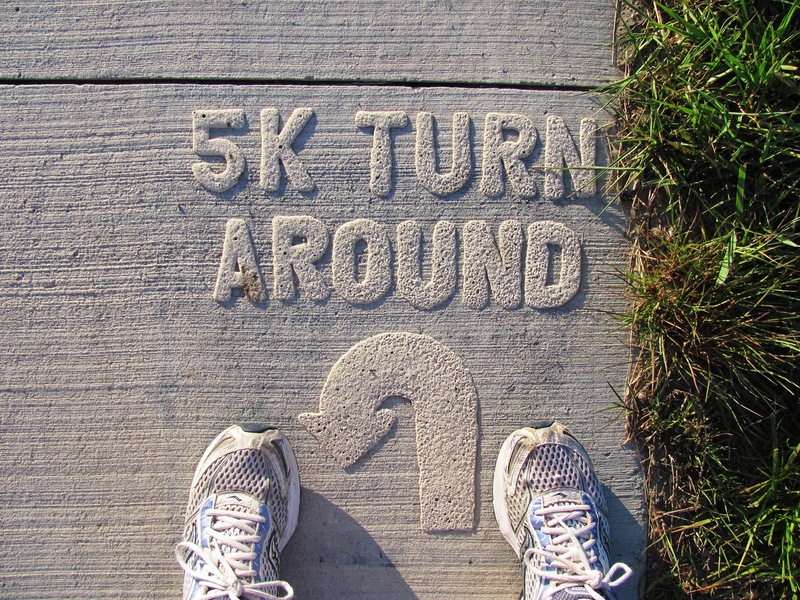 So, let me tell you about my 5K, and then I’ll honor all of my friends who were kind enough to play along! I was scheduled to race with my Athletes in Tandem partner, Zachary. You’ve heard of him, right? He’s the best! 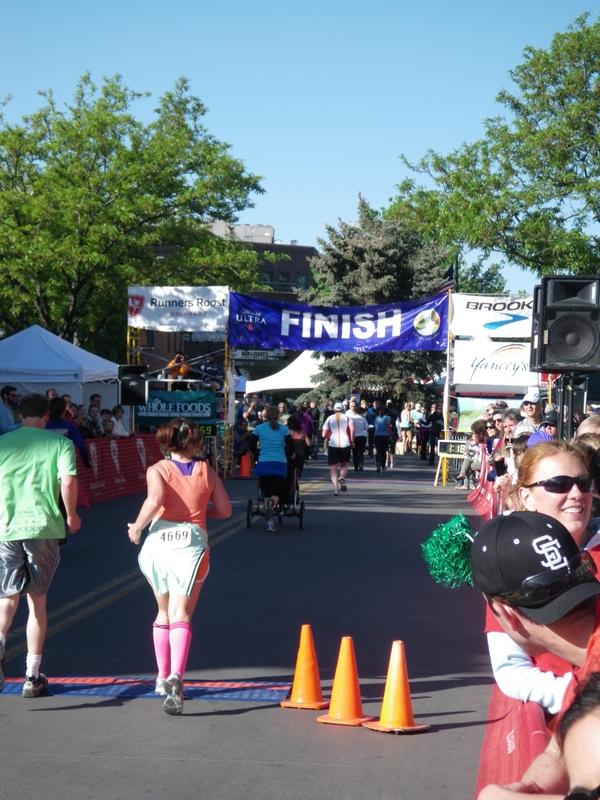 The event was the Fast and the Furriest 5K run/walk, sponsored by the Colorado State University Veterinary Teaching Hospital to benefit animals in need of emergency or life-saving treatments. I’ll run for that. I was bummed to learn that Zachary wasn’t able to make it to the race, but I was ready to go, had my bib number and needed to get my training in for the day, so… I decided to stick around. 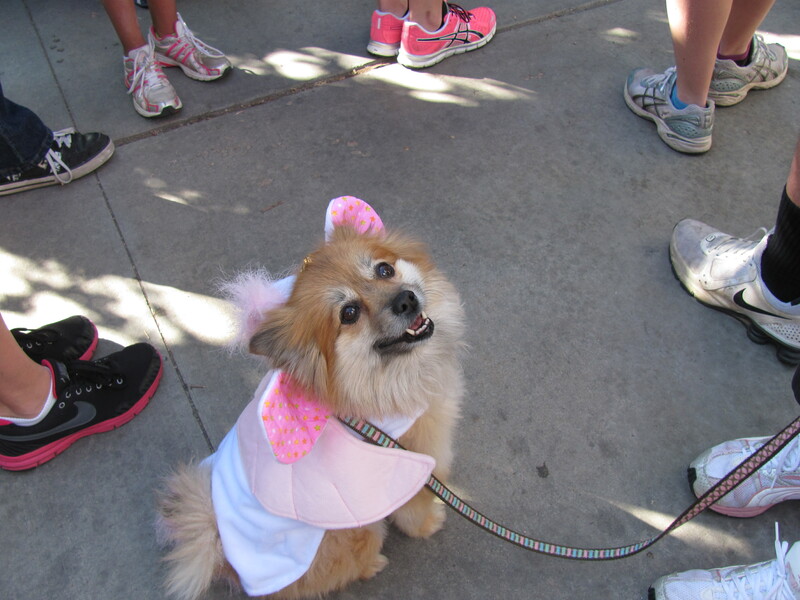 Besides, there were cute dogs excited to run… everywhere! It was the cutest thing ever! I need a dog! I found AiT partners Jessica and David and asked if I could join them, support them, push if needed. I haven’t run much in the past year, but decided to give it a try since I have been training hard in so many other ways. Well, guess what? We made it! David, Jessica, and I crossed the finish line together at 34:22. And they didn’t need my help one bit! Jessica and David just after the finish line! Awesome job! It was time well spent getting to know you both a little and I look forward to joining you in other upcoming runs! I don’t know her name, but she sure knew how to pose for the camera! This guy was just too cute! I wonder… if he and I were in a race together to get to the beer barrel first, who would win? Wait, maybe you shouldn’t answer that! Bill Gehrman (also great friend and dad to our daughter!) 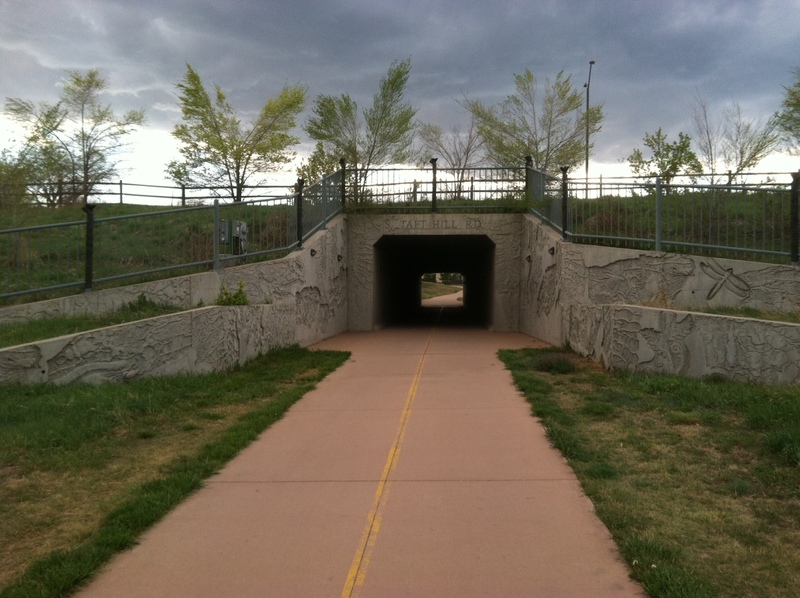 – ran 4.1 miles in Greeley, CO – including the killer hill on 4th St.! Wendy Mader (inspiring friend, coach http://www.t2coaching.com/, IRONWOMAN!!!) – cycled 100 miles and ran 15 miles with her cute dogs this week! Danny Nelson (Wellness Intern Extraordinaire) – umm… mowed a really HUGE lawn! 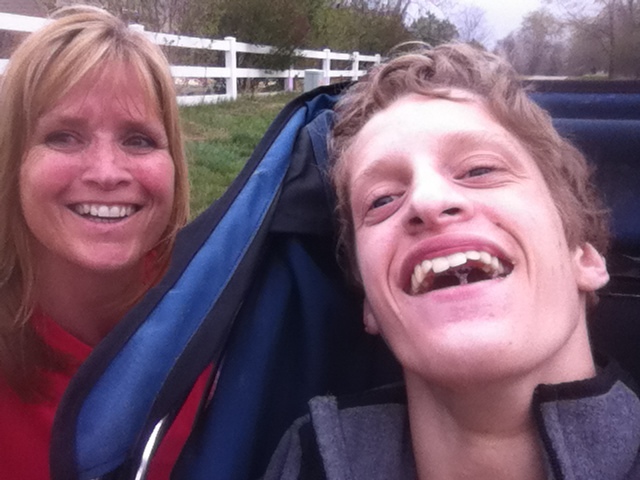 Lisa Gardner with son Caden (sweet friend who I hope realizes how great she is!) – got moving together… details, details? Angie Rhodes (very respected and fun friend, Wellness Guru and Champion!) – rode down the Blue Sky Trail http://www.larimer.org/parks/bluesky.htm and then mountain biked with her little munchkin! Cindy Arnold Humiston (neat lady and triathlete I met recently in my FB fitness group!) – 50 mile bike ride AND an 8-mile raft ride down the Animas River through Durango, CO! Woo-hoo! Thanks to everyone who sent me their info! I love it! And I love Colorado! Next week is the Colorado Marathon – I know many people who are running either the marathon, the half, or the 10K. I’ll be there at the 10K with my AiT partner Zachary so stay tuned! I’m really looking forward to it! Peace. Out. The past week or so has presented one great experience after another for me! 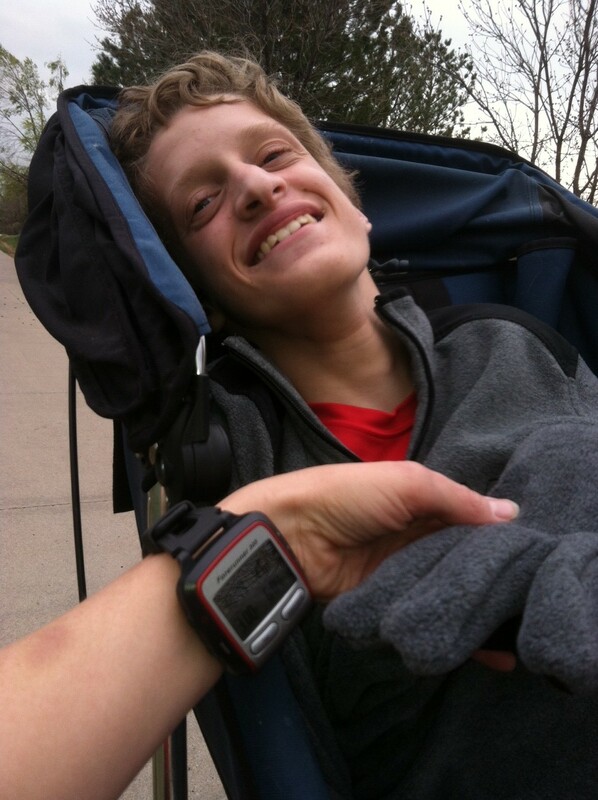 Just being able to get outside, enjoy the weather and push myself (and Zachary) to go faster and farther has left me with a great sense of accomplishment! We have now have surpassed my former solo walking pace and distance! I’m sure it’s due to the inspiration I get from having such a great partner and witnessing others participate with Athletes in Tandem! Speaking of inspiration, I attended the Horsetooth Half Marathon to take photos, cheer everyone on, and watch Zachary and Travis compete together! A-MAZING! I was waiting at the Poudre Trail bridge to capture the perfect shot, but before I knew it, near the head of the pack came Wendy and James, then Dennis and David, and then Travis and Zachary! Wow – I was so excited the only photo I got then was of the top of Dennis’ head. Sorry, friend – do you want me to post it? You know, I love to take photos, but I just don’t have a good setup that works while I’m training or racing… OR, apparently, cheering on the great athletes at the 1/2! Luckily, there were some very talented real photographers there! I absolutely love this photo of Travis and Zachary by Ryan at ColoradO2 Photography! Please also check out Ryan’s blog at http://rednavelracing.com/ ! The photo below by Jeremie Schatz really makes me happy! I was telling Zachary to have a great run (or maybe just being silly and trying to make him laugh – he has a great sense of humor)! Thanks for being there and capturing a special moment, Jeremie! Um, as much as Zachary loves it when I turn the viewfinder on my phone camera around and take silly photos of us, this is what we really needed! As I was training with Zachary this week, and my legs were burning from pushing him nearly 7 miles, all I could think about was how easy the amazing AiT athletes make it look. 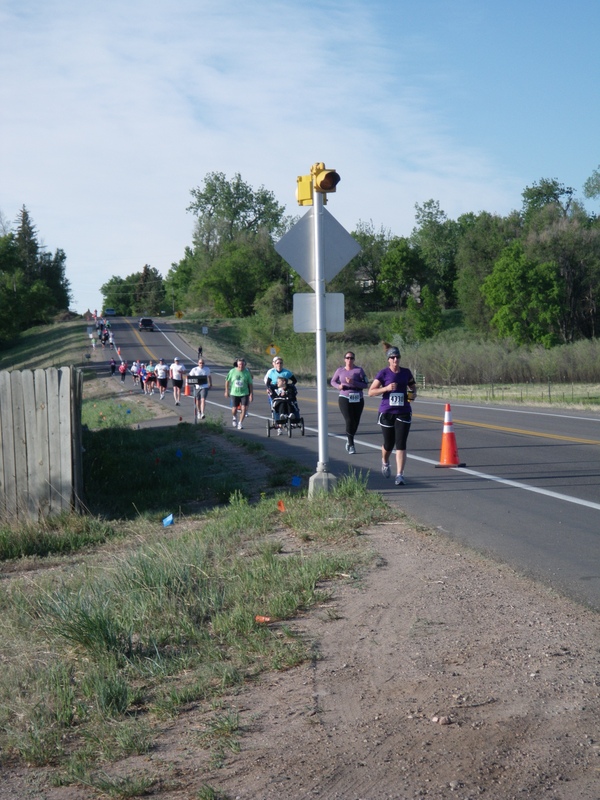 Uphill at the Horsetooth Half! YOU ALL ROCK! I am inspired to push my body to do the best I can for me and my partner Zachary, in whatever race we compete! I know, I know, there are a ton of exclamation points in this post! I can’t help it; I am excited! I am inspired! I am… in awe! 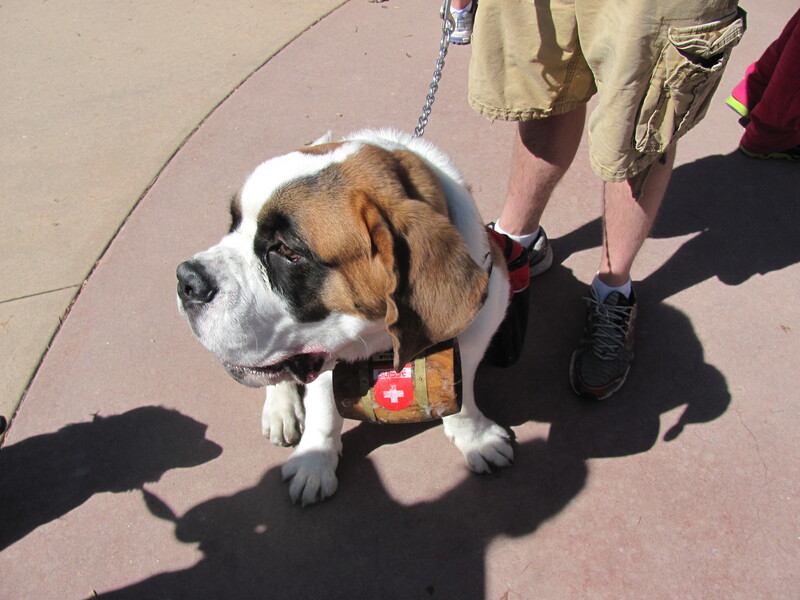 When I showed up today, Zachary seemed tired and of course I questioned whether he wanted to go for a walk. The gals informed me that Zachary was tired from his very busy day yesterday – yoga with Emily, then swimming, and then a run with Dennis. Now, that’s training! It’s wonderful that he can get out and be active! 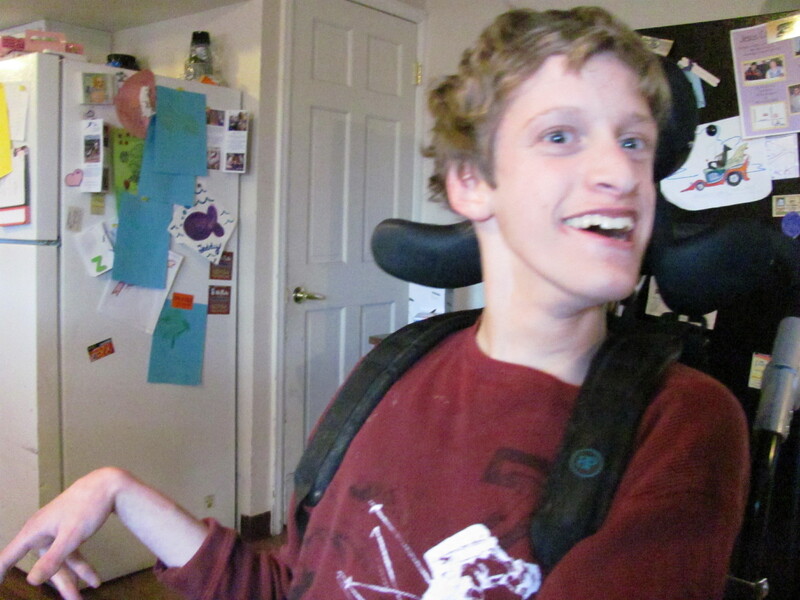 I’ve been told that a very high percentage of people with disabilities spend their days in front of a TV. Not at Zachary’s house! 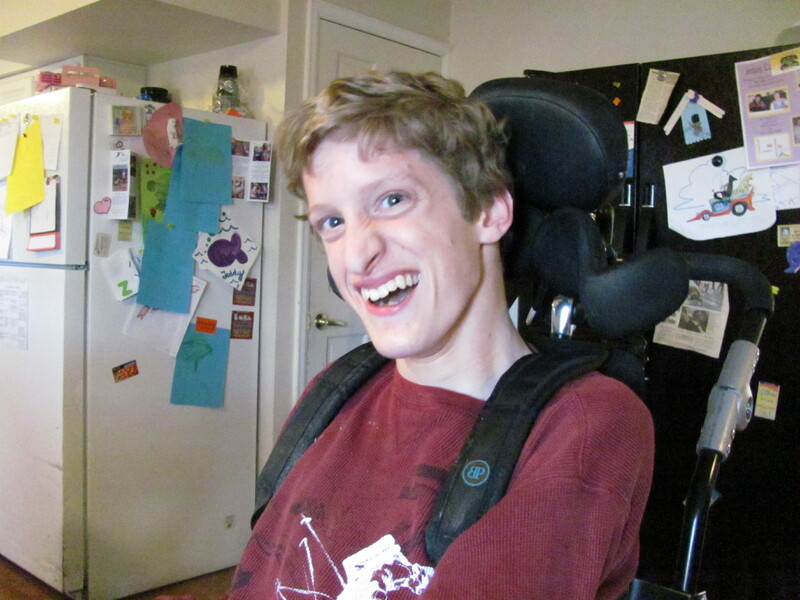 Mr. Zach has amazing family, caregivers, and friends who enable him to participate in many activities! We saw some pretty great stuff OUTSIDE! I tried to multitask and shoot video and photos while walking and pushing, BUT it didn’t work so well! So… I stopped to take a few (and stopped the timer on my Garmin so I wouldn’t mess up my time and my pace)! 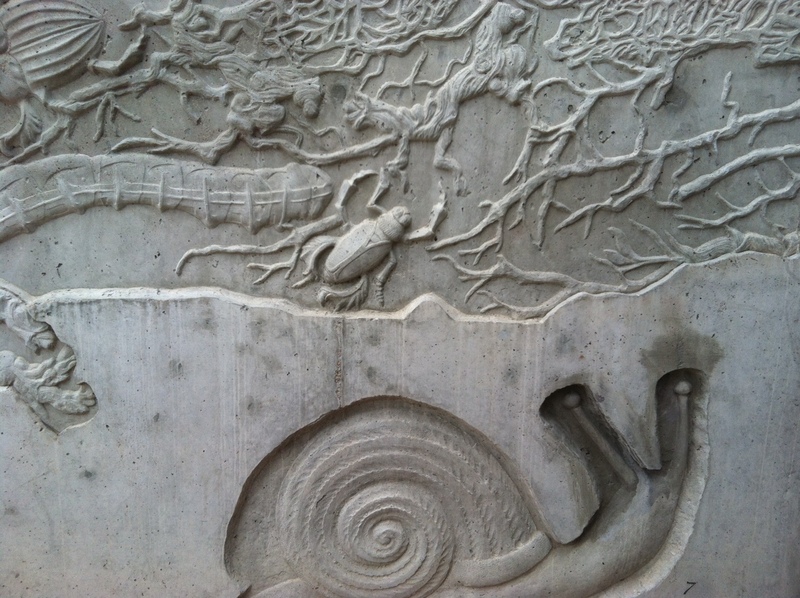 We went a little further this time and I was delighted to come across this artwork on the Spring Creek Trail! This isn’t my normal trail so I’m pretty sure I’ve never noticed it before. At least I’ve never slowed down enough to look at it. So cool. Zachary seemed to enjoy it, too! We saw tons of other great stuff today: horses, dogs at the dog park, all kinds of blooming plants, kiddos riding bikes and playing soccer, big kiddos playing adult kickball (FUN)! I wanted to take more photos but was afraid we might not make it home in time for supper! I need a helmet cam, or sunglasses cam… something like that. I may be against TV, but I still love all kinds of electronic gadgets! 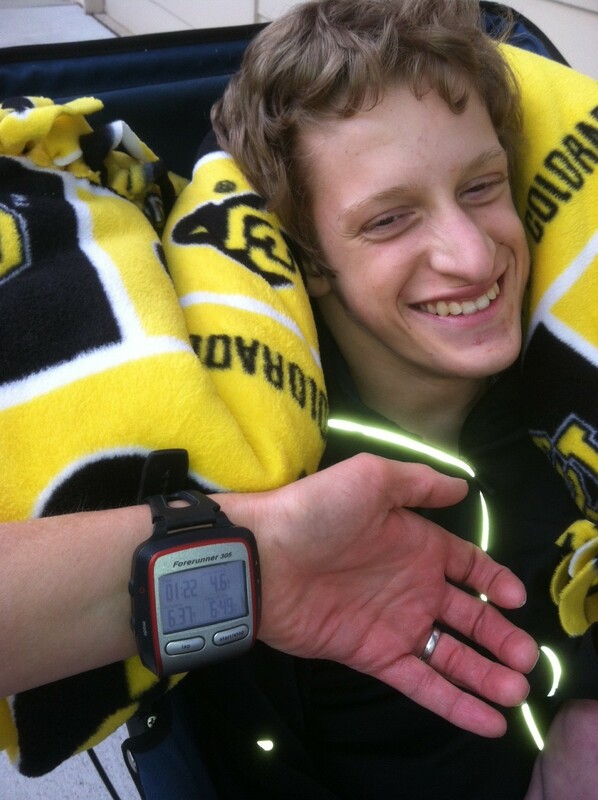 This is me trying to show you my Garmin with our final time, distance and pace: today we walked 6.37 miles in 1:22. That was my fastest solo walking pace before I partnered up with Zachary! Okay, okay, I ran just a little to keep our pace where I wanted it to be and because Zachary was having a good time! We just might have popped a few wheelies while we were at it. And laughed… a lot! Now turn off your TV and go enjoy OUTSIDE! Only 26 days ‘til race day friends, and I’m really getting excited! Because I’m also training for the Pelican Lakes Triathlon, my training includes cycling, walking, strength training, and swimming. Well, occasional swimming – I’ve really got to step up that aspect of my training! My last two weekends were spent enjoying some other important people in my life so I’m a bit behind on my long walks and rides that I normally fit in on the weekends. Todays walk: 5.6 miles in 1:14, roughly 4.5 mph. My best solo walk was 6 miles at 4.6 mph, so we’re getting there… Hey, we might even surpass that! I used my cell phone to take photos so Zachary could see himself, which he seems to think is pretty cool. Catching the fun moments is pretty cool, too! This is halfway through our walk today and I’m excited to report that Zachary seemed happy and relaxed the entire time! Awesome. In support of Athletes in Tandem, four of my friends have volunteered to work at the aid booths at the Colorado Marathon – yay friends! I also just had another friend contact me about competing with AiT! You all ROCK! It means so much to me that folks are willing to give even a little bit of their time to support a great organization! 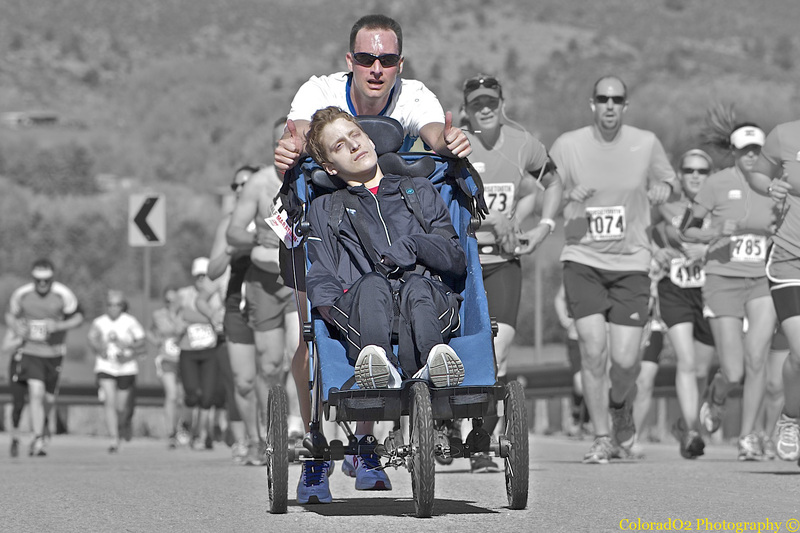 Besides, they will also be helping all of the athletes who have come to compete in the Colorado Marathon! If anyone else is interested in volunteering, please contact me via commenting on this blog or on Facebook. Thanks, friends! What a gorgeous day! Even though it was a little more Spring-like I kept my promise to spend some time getting to know Zachary better, hopefully giving him a chance to get to know me better. When I arrived he was having his dinner and thoroughly enjoying it! Caregivers Gretchen and Stephanie (very sweet young ladies, by the way) were there, so I picked their brains a bit while we had fun! I didn’t have to ask what it meant when they said my friend was in a great mood! Blurry photos? Who cares?! I couldn’t seem to get a photo that wasn’t blurry because we were laughing and smiling so much! Good times. Did I tell you he has an incredible smile? Well, he also has the best laugh! I think we should all be able to put aside worries, judgements, expectations and just smile and laugh sometimes. It’s therapeutic, really. Thanks, Zach. Wanting to test Zachary’s comfort level, I decided to take him for an easy walk. My primary goal was to walk with him only for as long as he was comfortable. 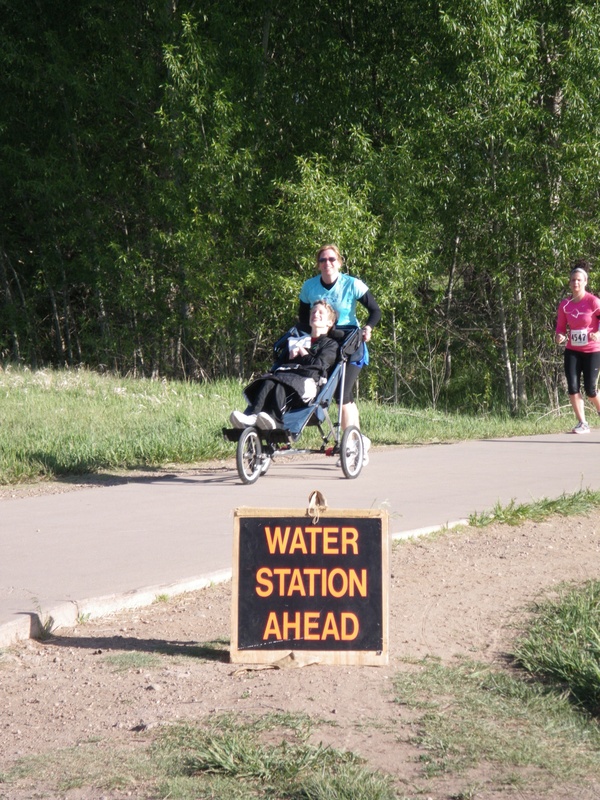 We used his wheelchair instead of his jogger because I want to ensure I know how to use the wheelchair insert next time we use the jogger. I am hoping that will make him more comfortable on the longer, faster walks. We strolled for about 20 minutes and yes, I had my “hovering mother” guard up. Zachary didn’t seem uncomfortable, but wanting to end on a positive note I headed back to the house. Chance had arrived just in time to remind me that… guess what? I worry too much. Haha – true, what a great guy! So, when Gretchen brought another resident out for a walk we all went for a bit longer. When we arrived back at the house I warmed Zachary’s hands by putting his in mine and blowing on them. More laughs, more smiles! I’ll remember that. Gretchen kindly took a photo of Zachary and me together – I’m pretty sure we were laughing about something here, too! All in all it was a great training day… training me for a friendship with a pretty cool guy! I love the Francois Mauriac quote. I stored it on my phone some time ago, knowing I would borrow it one day. I posted it not only because it is appropriate, but also because I’ve been struggling to put my feelings into order – and into words. Sometimes we need to borrow the insight of others to dig a little deeper into our own meaning. To give us a stopgap until we can admit what we don’t know. By “we” of course I mean, “I”. After pondering my thoughts for the past five days, I decided I’m not being authentic if I don’t share the not-so-joyful times. There’s something so very vulnerable about letting people know your true feelings and thoughts. I’ve said it before: a little introspection can be a good thing; sharing it with the world might be questionable! In this case however, if I can help someone understand what it means to know a person and value and respect him for all that he is, I’ll share. Wholeheartedly. I had big plans last Wednesday for my time with my training partner. However, based upon my previous experience, which was pure magic, I couldn’t seem to make that special connection this time. I wanted some validation that it was okay I was there, that it would be good to take a walk. Chance reassured me that Zachary was in a good mood so I guessed it was okay. I didn’t really know. 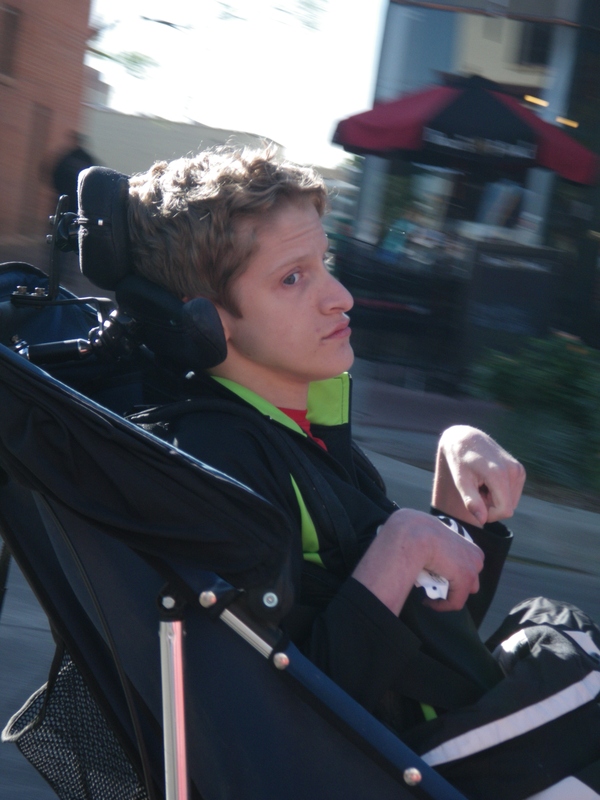 On our walk, one joyful sound was all I heard, but what does that equal in terms of Zachary’s happiness? I’m not sure I’ll ever know. I certainly don’t always laugh or smile just because I’m happy! I stopped briefly under the blossoming willow tree that overhangs the path we’ve been walking. Have you ever noticed what an intoxicating aroma willows have? “Zachary, isn’t that scent amazing?” It is. About 30 minutes into our trip I got a crash course in using the magnet. I was pretty sure he was having a seizure and I knew that using the magnet, if done right, wouldn’t hurt him. It seemed to calm him, but I also noticed that he was cold. My warm hands seemed to calm him, as well. I definitely need to figure out this temperature thing! As we headed back to the house, this scenario played out a few more times. Although I was scared, I was told that Zachary would be fine. I need to trust those who know him. I do. By the time we got home, he was fine. Maybe he had been uncomfortable or cold in the jogger, but it broke my heart to think that he might be hurting and I didn’t know what was wrong. Next time, I will check the jogger to make sure Zachary has a cushion underneath him. I will make sure we have a blanket in case he gets cold. Now that April has decided to act like March, I’ll wait until the weather warms up again! In the mean time, I’ll spend some time hanging out and getting to know him better. What does that mean? Well, I do understand that communication and connections come in many forms. Spoken words are one thing, but unspoken words can portray some true insight. Any time we get to know a new person, it takes time and patience to learn the intricacies of their body language, vocal cues and facial expressions. As I spend more time with Zachary, it is my hope and goal to learn to read his cues… to learn at least some of what I don’t know.